KANSAS CITY, Mo. 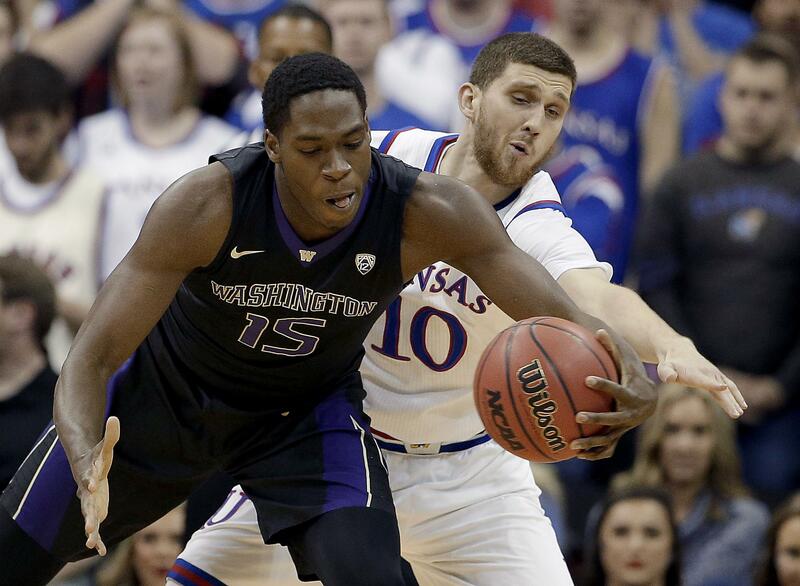 – First-year Washington coach Mike Hopkins saw how Kansas dissected Syracuse’s vaunted 2-3 zone defense last week, so he made a couple of tweaks to his version before facing the Jayhawks on Wednesday night. The Huskies frustrated the Jayhawks’ dangerous lineup of deep threats, Matisse Thybulle hit five-pointers and scored 19 points, and Washington kept its poise down the stretch for a 74-65 nonconference men’s basketball victory that knocked No. 2 Kansas from the ranks of the unbeaten. “We’ve been very fortunate this year to play a lot of teams that shoot 30 and 35 3-pointers. It’s really the Kryptonite of the zone,” said Hopkins, who spent 22 years on Jim Boeheim’s staff at Syracuse, a tenure that came in handy considering the Jayhawks just beat the Orange. “I felt like this could be our best opportunity to win the game,” Hopkins said. Jaylen Nowell also had 15 points, and Noah Dickerson added 13 points and 14 rebounds, as the Huskies (7-2) beat the Jayhawks (7-1) for the first time since December 1974. Lagerald Vick had a career-high 28 points for Kansas, doing almost all his damage in the middle of the Huskies’ zone. But he didn’t get a whole lot of help as the Jayhawks went 5 for 20 from the 3-point arc, including poor performances from their two best sharpshooters. Graham, coming off back-to-back 35-point outbursts, was held to three points on 1-for-8 shooting, while Svi Mykhailiuk was 3 for 12 from the field and scored eight points before fouling out. The Jayhawks had little trouble getting Vick open shots in the middle of the zone. The problem came in that he was just 12 of 23 from the field, even though most of the shots were bunnies. Throw in foul trouble that sent the Jayhawks’ two big men, Udoka Azubuike and Mitch Lightfoot, to the bench well before halftime and it was no surprise the Huskies took a 36-34 lead into the break. Washington kept the pressure on early in the second half, pushing its lead to 52-44 with 12:10 left in the game, before the Jayhawks finally turned up the defensive intensity. Vick got going again inside and Azubuike’s slam of an alley-oop pass trimmed their deficit to 53-52 with 9 1/2 minutes to go. The Huskies calmed back down after a timeout, though, stretching their lead again. Thybulle got loose for a transition dunk, Dickerson added a slam and Hameir Wright’s 3-pointer from the wing made it 69-56 – their biggest lead to that point. Even when the Jayhawks caught a break, like a technical foul on David Crisp in the closing minutes, they couldn’t capitalize. Graham missed both free throws with a chance to cut into a 73-59 deficit, and Mykhailiuk promptly missed a 3-point attempt as the Huskies put the game away. Published: Dec. 6, 2017, 8:09 p.m. Updated: Dec. 6, 2017, 8:42 p.m.